With the collapse of US interest rates, the dollar is replacing the Yen as the "carry trade" base currency. It's an easy trade to put on, even for a retail investor. A dealer or a fund can simply sell dollars forward against another currency. This trade is equivalent to borrowing dollars, converting them to another currency and lending the currency for a period of time. The interest expense on the borrow is significantly lower than the income from the lending because of the interest rate differential between dollars and the other currency. For example, the three month Euro LIBOR is 0.72%, while the dollar rate for the same maturity is under 0.3%. 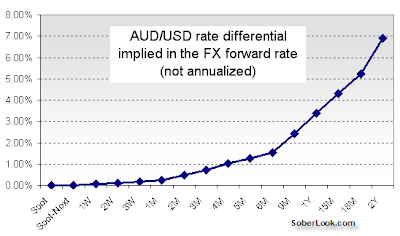 Putting this trade on with the Australian Dollar gives about a 3% annualized rate differential (the trade of course could be one week, 3 months, etc., depending on the optimal point on the curve and other considerations). But what makes this trade interesting for many is the amount of leverage one can get, even as a retail investor. A currency futures contract (see attached futures specs) may require less than 2% initial margin (50:1), creating 150% annualized return assuming FX rates stay where they are. So not only is the investor betting against the dollar, but even if the exchange rate doesn't move from current spot levels, the trade has a nice return. Of course in reality one needs much more capital than the initial margin because the dollar could rally as it did today, forcing either a variation margin posting or an unwind. For those brave souls who really like risk, a Brazilian Real trade may be just the thing. The rate differential is over 11% annualized. Of course this trade is getting increasingly crowded. The dollar is now viewed as a safe-haven currency, and any sudden perceived increase in global economic or geopolitical risk could precipitate a sudden dollar rally, forcing a violent carry unwind. Important: this is not any type of investment advice, just an observation.